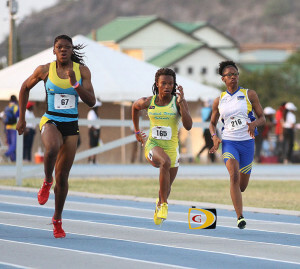 Taylor Hill, center, while competing at the Carifta Games. Hill moved to #6 on the BVI’s All Time List with her 23.84 seconds 200m run and became the fastest U20 female. Taylor Hill became the eight athlete establishing and outdoor British Virgin Islands National Jr. Track and Field Record this season, while twin sisters Trevia and Tynelle Gumbs improved their own, during respective competitions in Texas and California over the weekend. Competing for the Houston based Elite Performance Track Club, Hill became the fastest U20 female over 200m when she claimed her first Jr. National Record. Hill took down Nelda Huggins’ year old 200m mark of 23.91 seconds when she stopped the clock at 23.84 seconds in the Texas State Bobcats Classic in San Marcos. She placed fourth in her heat and eight overall while improving her best from 24.24 at the Carifta Games earlier this month in St. Kitts. Her mark—the sixth best ever by a BVI female—came after running into a -1.2 meters per second wind in the 100m where she ran 11.88 seconds to finish third in her heat and tied for seventh overall. At the Trinton Invitational in San Diego on Friday night, Trevia Gumbs used her first 40m throw to demolish her Hammer Throw personal best. Trevia carried her mark from 31.85m with a heave of 42.30m on her third attempt, destroying Alicia Leonard’s 18-year old mark of 35.06 for the new national standard. Twin sister Tynelle improved her best from 30.39 to 36.82 on her second try. After several fouls on Saturday, Trevia settled for a best measurement of 13.96m in the Shot Put and finished eight in the Open Division. Tynelle then rebounded from a series of poor Discus Throw performances to add three meters on to her personal best with a throw of 44.59m, to eclipse last month’s 42.16m mark. Trevia—who had beaten Tynelle in their last two matchups—also improved her best by three meters from 40.18m to 43.64. At the same meet, Eldred Henry best legal throw was 18.46m in the Shot Put as he finished ninth overall. After fouling his opening throws, he then settled for 48.02m mark in the Discus Throw. Jonel Lacey, competing at the Penn Relays, helped Jamaica’s Holmwood Technical High School to a fourth place finish in the 4x400m Relay. Lacey produced the fastest split of 55.01 seconds on a third leg carry, as Holmwood ran 3 minutes, 43.53 seconds. Montverde Academy Sr. Tahj Malone was second in the Florida Class 2A Regional High Jump with a leap of 1.93m. The self coached athlete was coming off a personal best of 1.98m in winning his District Championships. Cary High School Sr. Lakeisha “Mimi” Warner won a North Carolina SWAC Conference 300m Hurdles/400m double, with times of 45.91 seconds and 57.74.